On 3 levels, a bright living-room, a kitchen, 4 bedrooms -including 1 with a balcony- and 2 bathrooms. Beautiful view with no vis-a-vis on both sides. A/C on the West side. In front of the house, a terrace and a little garden lead to a 10m x 4,26m mooring. 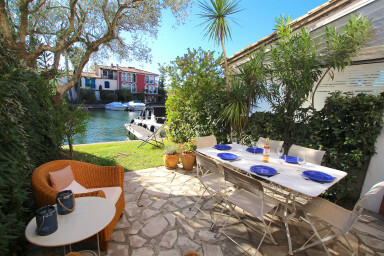 A cosy house that will easily become your new cocoon on the French Riviera!